Imparting Grace: Customized storage tin--for free! I'm excited to show you my latest creation: a customized storage tin that I made for free! 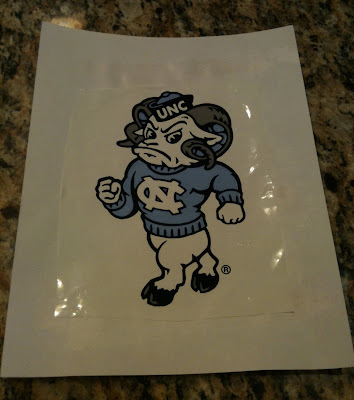 I was about to stuff this plastic bag into the container with all the other plastic bags when the mascot caught my eye. The wheels in my mind started turning, and I cut out the ram and mounted it on a sheet of white paper. And then I simply ModPodged the mascot onto the tin. I'm going to give this to Preston with the promise of homemade cookies for him and his roommate to share. 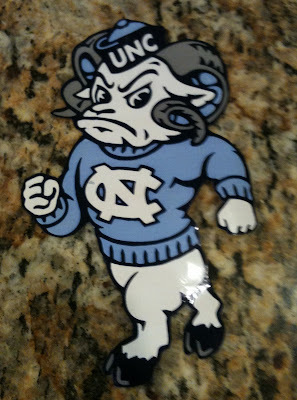 My oldest son will be a junior at Duke; I wonder if he'd like a tin with a Blue Devil on it. Can't you imagine one of these with your favorite team logo on it? Or with your child's favorite toy logo? That was clever. You never cease to amaze me! Please visit my blog to read Megan's Prayer...where I direct you to her blog. 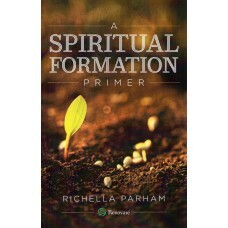 I am asking people to pray that God will bless her with a child. She has prayed for 8 years. you are one smart mama!!! i love great stuff for free!! and with the promise of cookies, i bet preston will be thrilled. wow... 2 boys in college. i bet lee is thrilled to get to be an only child! i will repost my story to your party on monday :) and i hope to be more active for it! this travel time gap has thrown me for a loop!!! love you!!! What a GREAT idea!! I know he will love it! What a cool idea!! It looks like a custom piece from one of the shops. Go 'Heels! I must know, do your boys have a friendly rivalry going on? I looked at Chapel Hill, but I thought it was too big for me so I went to Elon my Freshman year. Brilliant in many ways! I'm never quite sure what to do with some of those left over tins and it's a shame to just let them go. I adore this project! It makes me want to drive straight to Blacksburg to the Hokie bookstore to get a bag so that I could make a VT one. Your house is going to feel empty this fall with just one boy at home. You 're lucky that your two college boys aren't too far away from home. That turned out great! Your son is going to be very happy in Chapel Hill! My daughter is there right now and will starting her 3rd year. She LOVES it! That is quite a rivalry you family is going to have with one at Duke and one at UNC! Hi! I saw your comment over at Rhoda's when I went to leave one myself. ...clicked over for a visit! :) LOVE the tin idea! My daughter will be going to Meredith, moving in, in a few weeks! I will definitely be using this idea as we finish dorm preparations! Cute idea...what did you use to mount it to paper? spray adhesive? These would make great b-day gifts, filled with goodies! Brilliant! I bet I could do that with a University of Memphis tiger and give my guys some treats in it...thanks for the inspiration! On my way to go see Beth Moore yesterday, I decided to clear out my family room bookshelves and rearrange everything. (I had a few hours before my girlfriend was picking me up.) I wanted a container to put some kids' books in... couldn't find anything, and then found a wooden clementine box. I decoupaged some pretty scrapbook paper on one end. It turned out well, just took a few minutes, and was FREE! I love your idea for reusing bags... it always seems like such a waste to throw them away. Blessings! I still love sending my daughters "care packages" and they are long past college. oooo a house divided. Way to go Preston! I think I had the same bag at orientation in 1989. :-) Mine is still probably filling a landfill and this is a much better use.